When it comes to log home restoration, there is none better than 888-LOG-GUYS! Our professional staff is dedicated to making sure you have the best solution for your log home or log cabin in the Frankfort KY area. Our experienced work crew is friendly and will finish your log home project beyond your expectations. 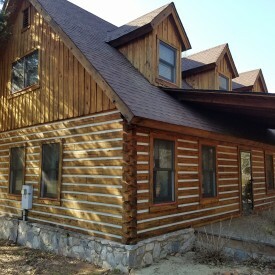 We are also experts in log home repair, log home chinking and caulking, log home improvement, and log home maintenance. If you aren’t sure how we can help you, then look at the descriptions below or give us a call! You will love the look of your log home once we are finished restoring it! We start with stripping the old stain with media blasting, and then sanding the logs down for a smooth finish. Next, we apply a borate treatment to clean the logs before sealing the log home with either chinking or caulking. 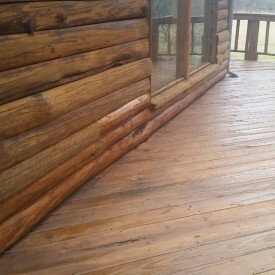 Lastly, we brush on the stain that will rejuvenate your log home and make it look even better than when it was new! If you don’t believe us, then ask for our referrals, or check out the testimonials on our website! 888-LOG-GUYS knows the ins and outs of log home repair. We have been in the business for over 15 years, and our experience is what you can rely on to properly fix your log home. Whether you have log rot, severe water damage, severe weather damage, bug, bee or insect holes, we can repair or replace your logs with very little interruption to your daily life. 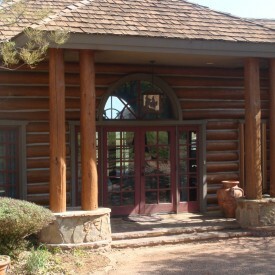 If you have concerns about the quality of your logs, call our staff to help you determine what your log home needs. You can even ask for a quote from our website! If you see sunlight in between your logs, then you may have found gaps that need to be filled. Our crew will properly fill in those gaps with either an energy seal, chinking, or caulking. This will prevent insects from invading your home, water leaks through the walls or around the windows, and air drafts through the walls or around the windows. Keep your log home in the Frankfort Kentucky area a safe and comfortable place for your family and friends! 888-LOG-GUYS would love to be your log home chinking and caulking specialists! 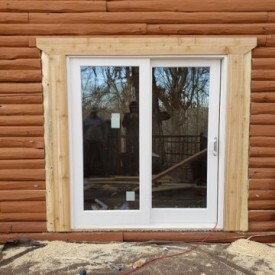 There are several different ways you could go about adding on or improving the quality and value of your log home or log cabin in the Frankfort KY area! Our experienced work crew at 888-LOG-GUYS knows how to build a log staircase or construct a log railing. 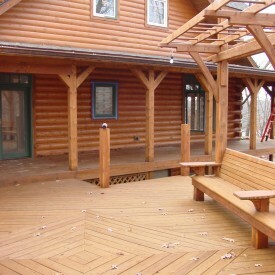 We even know how to build decks, patios, and porches from scratch! If you have something specific in mind, then no worries! Give us the chance to take a look at your home, and we’ll tell you how we can build your log home improvement dreams! You may be wondering if now is a good time to have your logs cleaned. Don’t wait a moment longer to ask 888-LOG-GUYS if your log home or log cabin is in need to be washed and re-coated! Or you may be concerned about the condition of your logs. Ask us today about what you need to do to keep your log home in excellent shape! Whether you are a past customer or not, we will always support you in taking care of your log home. Let us do the work so that you don’t have to stress about your log home care and what needs to be done. We will keep track of the optimal time your log home is due for maintenance and do the maintenance work. It is that simple! Call us today or ask for a free estimate from our website!